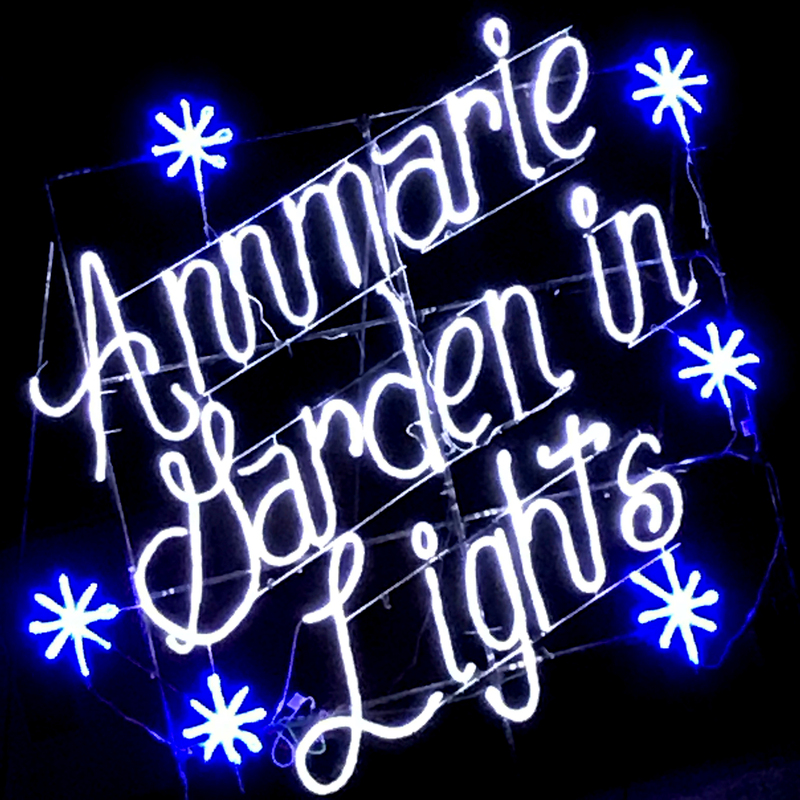 Annmarie Sculpture Garden & Arts Center in Solomons, Maryland, announces the Annmarie Garden in Lights for the 2018 holiday season. This family-friendly light art event is a joyful outing for all ages – and has become a favorite Southern Maryland holiday tradition. The Garden is transformed with more than one million lights in dazzling and unique installations and vignettes. Guests will be delighted with the quirky and unique “light sculptures” that transform the Garden into a glittering kaleidoscope of color. Take a walk through the protected ¼ mile wooded path, then come inside and enjoy live entertainment, food, and holiday shopping. “We love putting this show together each year. This event is all about the joy that it brings and celebrating the season. We are excited to be trying some new things this year that add to the experience with more lights and more dazzle.” says Stacey Ruff, director of Annmarie Garden. Annmarie Garden in Lights also features live entertainment each night, the Hardesty Haven Holiday Café, unique shopping in the Annmarie Gift Shop, an Ornament Show & Sale, Holiday Pop-up Shops, and much more! Special themed nights throughout the month include, Snow Princess Night, Scout Caroling Night, Santa Night, Festive Holiday Attire Night and Pet Night. Special nights include live characters who will greet guests and provide great photo opportunities. The Light Show will be open to the public nightly through January 1st between 6 and 9 pm with the exception of December 3 & 4th and 24th & 25th. Admission at the door is $7; free for children 2 & under; free for Annmarie members. Visit wwwannmariegarden.org to purchase special Fast Pass Tickets and for a detailed entertainment schedule. From Washington DC (about a 60 minute drive): take Route 4 South to Capital Beltway Exit 11 (to Prince Frederick). Continue on 4 South, following signs to Solomons. Left on Dowell Road at Hilton Garden Inn Annmarie is less than 1/4 mile on left. From Annapolis: follow Route 2 South towards Prince Frederick/Solomons. Left (South) onto Route 2/4 at Sunderland light. Left on Dowell Road at Hilton Garden Inn. Annmarie is less than 1/4 mile on left. « EYC Lights Parade Celebrates 30 Years!